The majority of problems encountered with dogs can usually be solved by the dog owner, once the source of the problem has been identified. As simplistic as this may sound, it is a fact that most behavior issues are caused by owners, either because of their interaction with the dog, neglect of correction involving the issue, or improper corrections. Many owners believe that their dog is a logically thinking being that is just making bad decisions. This could not be farther from the truth. A dog's entire life is governed by instincts and trained response, not logic. Let's take a look at the definition of logic as per Webster's Dictionary to see if it applies to what owners believe. a particular method of reasoning or argumentation. reason or sound judgment, as in utterances or actions. convincing forcefulness; inexorable truth or persuasiveness. Obviously a dog cannot provide any of the actions required to meet these definitions. One of the problems encountered in later years is one that was allowed to occur as a puppy. When the puppy first comes into the home, owners will spend their time playing and entertaining themselves and the puppy. As time goes on, the puppy grows, and playtime becomes much more time consuming and rugged. Because of time constraints, the owner begins to limit the amount of time provided for the dog to expend its energy. The dog becomes bored and looks for things with which to occupy itself. Unfortunately, the things that the dog finds enjoyable are not what make us happy. "Is it a Bad Dog, Bad Owner, or Misunderstanding?" Owners will then attempt to apply logic to the situation, and logic is nowhere to be seen. All the yelling and screaming in the world will not make the dog understand what you want. He's listening for commands, and all he hears is your "barking." Now the owner wants to get rid of the dog, have it euthanized, or complains about the breeder. This is just one example of how things can go wrong with your dog without your noticing it. There are many other situations which are owner created and can be corrected through common sense training methods. Before making the decision that you have been plagued with a "bad dog," you should have it examined by a veterinarian to ensure that the dog is not having a physical or medical problem. Medical and physical problems may often manifest into behavior problems, if untreated. Once it is established that the dog is not suffering from medical or physical problems, the principles and methods to correct the problems may be incorporated, thereby making a better relationship between dog and owner. When encountering behavior problems it is important to realize that the dog's actions are what he considers normal activity. He is not misbehaving because he is vengeful, spiteful, or just wants to ruin your day. Once you grasp the fact that your dog does not think like a human, you will be able to make the required corrections. In other words, "think like a dog." It was explained to me in my early years as a dog trainer, "If you want to train a dog, you have to be smarter than the dog!" This may sound like sarcasm, but it's the truth. Dogs will try to outsmart you if you allow them. You must be in control and always thinking ahead of the dog's next action or his response to your actions. You must "Be Prepared," and anticipate his next action. If you feel that you are able to provide the training necessary on your own but need some guidance, I would recommend the acquisition of my book, The Abney Method of Owning a Dog. This book will give you insight into basic training methods that will help control your dog's actions and aid you in correcting unwanted behaviors. It is better to seek out a professional trainer or behaviorist, as it will save you time and frustration. They have the knowledge and solutions to put you in control of the situation immediately. 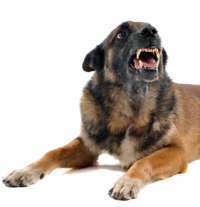 At ABCANTRA, we use simple, common sense solutions to resolve your dog's annoying problems. Behavior consultations are approximately one hour in length, and we provide you with the solutions to fix the problems. In the majority of cases, one visit is all that is necessary to put you on the path to becoming your dog's best friend. All dogs look for a leader within their pack (your family), and if you do not provide that leadership, they will assume the position. This is where the problems begin. If left unchecked, they develop into a "learned response" and continue their ill behavior. We have found through the years that many ill behaviors are corrected with a Basic Obedience course. Since dogs are pack animals and understand the hierarchy of the pack, basic obedience places you in the Alpha, or leadership position. Your dog begins learning basic commands that it must follow, and you are then given the respect of a leader. Keep in mind that any good leader is firm but fair. These are the methods by which we teach. If you have done any training with your dog, you will be on the path to eliminating most of the common annoyance problems people have with their dogs. Obedience training presents the dog with a job. If he has a job to do, his mind is occupied. He is listening to your commands and waiting for the next one. Boredom is a dog's worst enemy and an owner's nightmare.